On the Brink: Save our Right Whale. Save our Ocean. Our planet needs us now. We’ve all been hearing the heartbreaking news about recent North Atlantic right whale deaths. They are on the brink of extinction, BUT with our help this species can be saved. 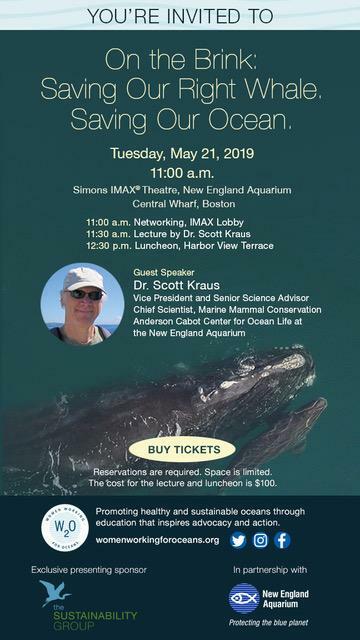 Join us W2O’s signature event ON THE BRINK: Saving Our Right whale. Saving Our Ocean. Mark your calendar for May 21, 2019. This year we are honored to feature Dr. Scott Kraus. Dr. Kraus has been a leader in ocean conservation and has worked tirelessly for over 30 years to save this beloved species. Please click here to buy your tickets! You can also attend the lecture portion for free.